Finding a reliable builder is a must if you do not have the time, skill or inclination to run your renovation or extension project yourself. Hiring someone to manage the project has cost implications, but also many advantages. A contractor will be able to look at the drawings and specification for your project, known as the ‘tender documents’, produce a detailed quote and construction programme, and as long as you do not make changes, should be able to deliver the project on schedule within the estimated budget. Use your guide to find the best builder for your project, ensure their references check out and that the prices they quote are fair. Find out more about extending a house and renovating a house in our dedicated guides. What is the builder’s role? Building contractors are professional project managers and business owners, ranging from one-man operations to small to medium enterprises. They understand the construction process and the building industry, and how to keep a project on schedule by co-ordinating labour and materials, plant, tools, equipment, and taking into account other elements, such as bad weather. They have a legal duty to comply with building regulations and owe you a duty of care. Depending on the firm’s size, they may have permanent employees, an administrative team, a quantity surveyor to price work, and a contracts administrator in charge of purchasing. Everyone wants their project completed quickly, cheaply and to a high standard, but you can only ever really achieve two of the three. A larger business may be more efficient due to staff levels but more costly, due to their overheads. A smaller operation may take longer to complete your project, but may be more competitive on price. 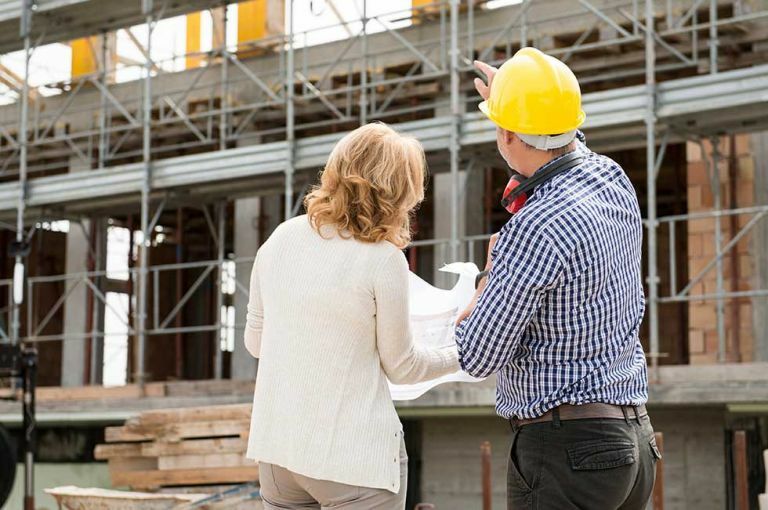 A contractor will calculate how much a renovation or extension project is going to cost in labour and materials, plus specialist trades such as electrics and plumbing, which are typically subcontracted, as well as preliminaries (site set-up costs, welfare facilities, scaffold, permits and permissions). They will add a charge for their own management time, plus an element of profit, typically between 15 and 20 per cent of the total cost. Looking for boards at other sites. Recommendation is the best way to find a reliable builder. Most small firms rely on their reputation and work hard to maintain it. Be aware that a good builder is likely to be very busy and require a lot of notice. Be suspicious of a builder who can start tomorrow. Are available when you need them to start. Details of how you want the quote set out, including any allowances for provisional sums (items that can’t be accurately priced without investigation, such as groundworks) and prime cost sums (for any items not yet chosen). Did they undertake the work to a satisfactory standard? Was the project completed on time and on budget and, if not, whose fault was it? Contact the contractor’s all risks insurer and make sure they have sufficient cover in place. Finding the right tradesperson for your project needn’t be daunting, and with proper research and time spent checking a trader’s reputation, you can be confident in your choice. Start by searching for companies on websites such as trustmark.org.uk, checkatrade.com, ratedpeople.com and trustedtraders.which.co.uk or accreditation bodies for a specific trade type, such as fmb.org.uk for builders. Simply use your postcode and make a shortlist of those that meet your criteria. Federation of Master Builders (FMB): FMB is the largest building industry trade body, representing over 13,000 vetted small- and medium-sized builders. There is a code of conduct and it operates a service that will match its members to your needs. TrustMark: This Government initiative is designed to help the public find reliable contractors and tradespeople. It has a vetting procedure and awards the TrustMark to those that comply with Government-endorsed standards. Search for local members. National Federation of Builders (NFB): The NFB represents around 2,000 small- and medium-sized contractors and has a code of conduct and arbitration procedure. You can search online by location and specialism. Scottish Building: An umbrella organisation for 19 independent trade bodies with a range of specialisms, Scottish Building runs an online service to help match homeowners with local contractors. The Guild of Master Craftsmen (GMC): The GMC is a trade association that represents a number of different trades. Members are asked to observe a code of conduct and the guild offers a dispute resolution service. Search for a variety of local craftspeople. Should I look for a builder online? Find-a-builder websites attempt to match your needs to local trades, charging a fee to the builder on their listing, lead, or work that proceeds to contract. Some websites check qualifications, insurance and customer recommendations; others give leads to anyone willing to pay for your details. Services include Checkatrade.com, Mybuilder.com and Ratedpeople.com. Can I avoid paying VAT? If you are planning to take advantage of VAT concessions on your renovation work, such as the reduced rate for dwellings empty for two years or more, it is essential that your contractor is VAT-registered. Most renovation work attracts VAT at the standard rate of 20 per cent; however, if any subcontractors you use are not VAT-registered, they must not charge it on their labour, which can save you money. Make sure that the subcontractors are aware that the work they are doing is eligible for a concession so that the appropriate rate is charged. Is the cheapest quote ever the best? Try to get at least three different quotes for your project. Once you have analysed them and chosen one or two that look realistic, you can try to negotiate on areas where one has charged more than the others. It is always wise to be cautious of quotes that appear too good to be true – they usually are. If a single quote is much lower, it’s likely to either have omissions, or the contractor may be planning to make up the difference once they have secured the contract, by exploiting loopholes in the specification and tender documents, or by overcharging for later variations to the contract. It is very important to have a written contract in place and a copy should have formed part of your tender documents, so that the builder is aware of the terms and conditions on which they are basing their quote. If you’re working with a project manager, such as an architect, who will help find and appoint the builder and then administer the contract, they will probably want to use one of the standard contracts published by the Joint Contracts Tribunal (JCT). A guide is available at Jctltd.co.uk to help you choose the right one. Some larger main contracting firms and specialists, such as loft conversion companies, may have their own standard contracts. If you are appointing and managing the builder directly, you’ll need a different form of standard contract. The FMB produces a free contract, which can be adapted to individual projects. Another standard contract is available at Contract-pack.com, to download for £14.99. If your project is in Scotland, make sure you use a contract that is appropriate for Scottish law. What about prime cost contracts? An alternative way to work with a contractor is on what is known as a ‘cost plus’ or ‘open book’ basis, whereby the contractor charges for labour, materials and plant at cost and then adds an agreed mark-up, usually 15-20 per cent, for managing the project. This is a transparent way of working but does rely on trust: in particular you must trust the contractor and his team to work efficiently, not to drag the job out and inflate labour costs, and to only charge for materials used on site. They may or may not include an insurance-backed guarantee in their quote. However, if you’ve tried this and failed, the next step is to get help from a third party, such as a regulatory body, Trading Standards or the Consumer Ombudsman. If you sourced the tradesperson through a regulatory body, or if they are part of such an organisation, they should have a system in place to deal with disputes and offer you support in handling the situation, or offer to liaise with the company on your behalf through an Alternative Dispute Resolution process. The best results often come from projects where a clear brief has been drawn up prior to work commencing, as each party knows who is responsible for what, and any discrepancies can be seen as a breach of agreement. ‘It is vital that both the trader and the homeowner uphold their part of the agreed contract, including regular payments and staged inspections to ensure work is done to the appropriate quality,’ Simon Ayers explains. ‘A contract is legally binding and without it, it’s simply one person’s word against the other, leaving you in a potentially vulnerable position.’ Unfortunately, if no contract was drawn up, you may find it difficult to come to a solution, risking financial losses and personal distress. Tim Roe from Rated People agrees: ‘If you‘ve managed your project properly with a good, clear and agreed brief and contract, which, in its simplest form can even be an email exchange, you will be covered.’ Remember to deal with proceedings in a professional manner, too, as remaining factual and unemotional when things go wrong is crucial to reaching a quick solution. ‘It’s easy for tempers to soar when money and the results of a home transformation are at risk, but this could hinder the resolution process,’ says Tim Roe. Be proactive and address issues early, escalating problems to the relevant body as soon as possible after you’ve attempted to communicate with the tradesperson first with no luck. Verdicts by regulatory organisations, Trading Standards or the Consumer Ombudsman can be binding, so once the verdict has been ruled, the case will be closed, unless you take it to court as a final resort, which can be costly.